Choice Privileges has launched (yet again) promotion for a free night after two stays between September 3 – November 11, 2015. You will get minimum of 5,000 points and maximum of 8,000 points for these two stays depending on the number of base points that you have earned. You can then redeem 8,000 points for a free night at many Choice locations. Note that stay is defined as minimum of two nights at the following “budget” brands: EconoLodge, Rodeway Inn, Suburban Extended Stay Hotel and MainStay Suites. Choice Privileges has occasionally lowered quite a few hotels to 8,000 point level for redemption purposes. Good promo for those that tend to stay at they their properties. Unfortunate that you can only earn the bonus once. Free night is based on an 8,000 point Choice Privileges reward night level. Registration required at ChoiceHotels.com/earnafreenight before check-out. Members must book trips via ChoiceHotels.com, the Choice Hotels mobile app, or 800.4CHOICE at qualifying rates. Corporate travelers may book through a travel agent or corporate online booking system. Choice Privileges member number must be provided upon check-in. After a second qualifying trip with arrival between 9/3/15 and 11/11/15, members will be awarded a minimum of 5,000 and maximum of 8,000 bonus points, depending on the number of base points earned from the two (2) separate qualifying trips. These bonus points will allow redemption for a free night at the 8,000 reward night level at over 1,500 hotels. 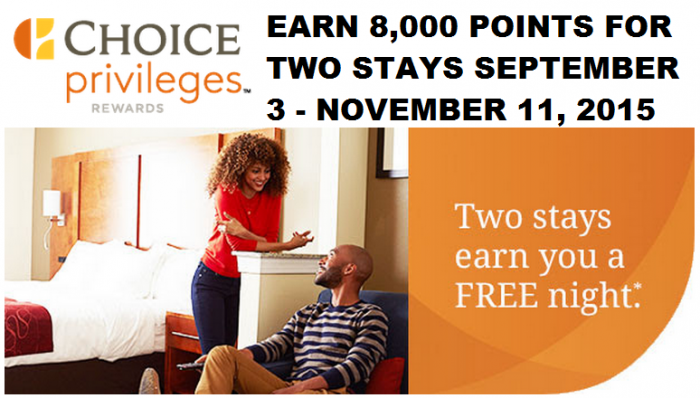 A free night at most Choice Privileges locations requires more than 8,000 points. For Comfort Inn, Comfort Suites, Quality, Sleep Inn, Clarion, Cambria hotels & suites or Ascend Hotel Collection hotels, a trip is defined as a stay that is any number of consecutive nights at one hotel regardless of check-ins or check-outs. For Econo Lodge, Rodeway Inn, Suburban Extended Stay Hotel, or MainStay Suites hotels, a trip is defined as a stay that is two (2) or more consecutive nights at one hotel regardless of check-ins or check-outs. Trips at vacation rental property locations and stays booked with the SEGEN rate code do not qualify for promotional bonus points. To be eligible to earn the bonus, members must set their earning preference to Choice Privileges points in their online account. Any change made to earning preference will remain in effect after the promotion has ended. Allow 72 hours from check-out for points to post. You must maintain an address in the U.S. (including U.S. territories) or Canada to be eligible for this promotion. For Choice Privileges program details, eligible rates, eligible countries and point redemption rules, visit choiceprivileges.com. Hotels are independently owned and operated. 1. How do I get my ‘free night’? I’ve taken my two separate qualifying trips. Redeem your bonus points for your free night through your online profile or by calling the Choice Privileges Service Center. Check in between September 3 and November 11 to earn. Current Choice Privileges members can register here before their first trip. Not a member? Sign up for Choice Privileges and be automatically registered for the promotion. You’ll be earning points for free gift cards in no time. Book via ChoiceHotels.com, the Choice Hotels mobile app, or 800.4CHOICE. Don’t have the app? Download it here. Elite Diamond and Elite Platinum can book directly with a hotel. An auction web site is one in which you “bid” or “negotiate” the rates with the web site in order to lower the rates. These web sites are not eligible for the guarantee because we cannot confirm that the lower rate is publicly available for anyone to reserve. 5. How can I book as a corporate traveler? As a corporate traveler, you can book your stays through a travel agent or corporate booking system to qualify. However, stays booked with the SEGEN rate code do not qualify for promotional bonus points. As a member, you must complete ‘two separate qualifying trips.’ ‘Trip’ = 1+ consecutive nights at Comfort Inn®, Comfort Suites®, Quality®, Sleep Inn®, Clarion®, Cambria® hotels & suites or Ascend Hotel Collection® hotels ‘Trip’ = 2+ consecutive nights at Econo Lodge®, Rodeway Inn®, Suburban Extended Stay Hotel®, or MainStay Suites® hotels. NOTE: Consecutive nights at one hotel only count as one trip, regardless of check-ins or check-outs. The same rates that are always eligible for Choice Privileges points are eligible for this promotion. You earn Choice Privileges points for individual travel on the following rates: Best Available Rate, Advance Purchase, Corporate, VIP and Net Preferred, Government/Military, Travelers’ Discount, AAA/CAA, PSCIEN, Package Rates, Small Organization Savings/Significant Savings, Senior Rate, Sports Rate, CPSA, Preferred Customer Savings Rate, Savings at Work, negotiated rates (N) and select LSRPs (select locally negotiated rate plans). 9. How many times can I receive the free night bonus? You can earn an unlimited number of bonuses! After you register, you’ll earn points for a free night after every two separate trips. 11. When will the bonus points post to my account? No, you must set your earning preference to Choice Privileges points in order to participate in this promotion and receive the points for your gift card. Please note: Your earning preference will remain set to points after the promotion has ended. If you would like to revert to earning Airline Miles or Amtrak Guest Rewards, you must reset your preference in your online account. 13. Are international trips included in the promotion? 14. When do my Choice Privileges points expire? Choice Privileges points expire on December 31, two years after the year in which they were deposited into your account. 15. What is the Advance Purchase Rate? Advance Purchase Rate means that the reservation must be made on ChoiceHotels.com using your Choice Privileges number and must be made at least 7, 14, 21 or 30 days in advance, which will vary based on the hotel for which a reservation is being made. The rate starts at 15% off Best Available Rate, is non-cancellable, non-changeable and non-refundable. Your credit card will be charged for the total reservation amount within 24-48 hours of booking. 16. Other questions? I don’t see mine here.